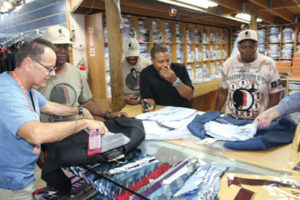 On Thursday, April 4, 2019 at the Miami Dade Chamber of Commerce, in partnership with Austin Burke Clothiers, presented each member of the Hunger 9 with a new suit, shirt and tie at Austin Burke at 2601 N.W. Sixth Ave., Miami, FL 33127. The Hunger 9 are nine men, members of the Miami-based group Circle of Brotherhood, who chose to bring attention to the scourge of ongoing gun violence in the Black community with a 21-day hunger strike.